After recent articles discussing our decision to focus on a Whole Foods Plant Based diet, I’ve received a few requests to write about what I pack for my kids’ school lunches. So over the past couple of weeks, I snapped some quick pictures (when I remembered!) 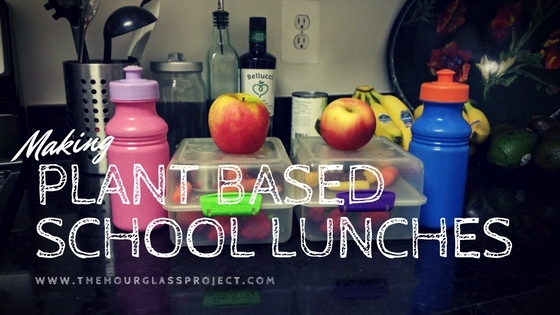 of the kids lunches before packing them up in their lunch boxes and sending them to school. I am not going to lie, creating Whole Foods Plant-Based school lunches for my kids started out as a bit of a challenge. Especially since their school has become a Nut-Free Zone this year. This added an extra layer of difficulty because we use nuts, nut milks, and nut flours in a lot of our foods. But with any new journey there are always hurdles and hiccups. We had created habits of easy go to lunches that now how to be broken and replaced with new habits to fit our new lifestyle choices. The first couple of weeks were definitely the hardest, but I feel that I am now getting into a rhythm and it seems just as easy as it used to be. The bonus is that I feel confident in the food choices that I send them to school with and they love their lunches. I never in a million years would have expected that my kids would be requesting for more salads! 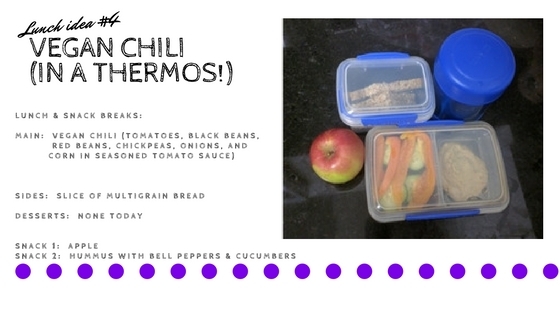 Below I have chronicled 5 actual lunches that I packed for the kids. 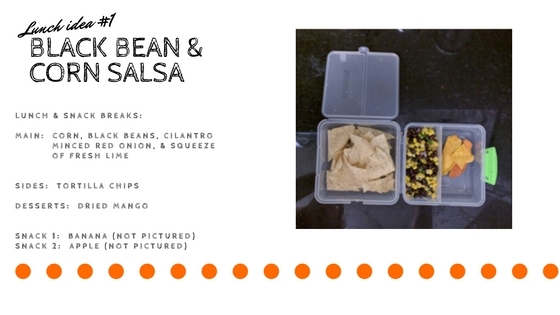 These images are over a two week period as we often repeat these throughout the week or offer variations of the lunches illustrated below. My kids ask for the salad (lunch #2) two or three times per week. It is their favorite! For my son’s class I pack two snacks, but my daughter’s class only has one snack per day. I have opted to show my sons lunches as it highlights more food options. This meal is one of my easy go to lunches if I don’t have “fresh” foods ready to go. I typically have cans of Organic black beans and corn on my shelves and we almost always have a bag of tortilla chips in the pantry. I have also sent this without chips or paired with rice and had happy kids in all scenarios. This lunch is my kids favorites. It is a take on one of the salads that we love at Sweet Greens (if you missed my post on SG, click here to check it out!). It is simply mixed greens finely chopped (this is key!) with chunks of apple and pear, sunflower seeds, and chopped basil. The Sistema lunch systems we use have a salad kit that allows me to put the balsamic dressing in separately so the salad doesn’t get soggy. I also have room on top to put a piece of bread and treat (a coconut macaroon). And underneath the top is a fork and knife. In this scenario I gave pears, grapes and baby carrots for the first snack and lightly salted popcorn for the second. 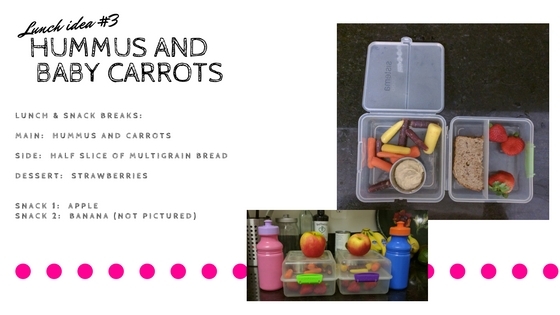 For my third lunch I packed the kids hummus and carrots for their main dish with strawberries and half a slice of bread for their sides. Then I packed a banana for first snack and an apple for second snack. I was a little worried that this may not be enough food, but I always check in with the kids and they said it was just fine. I can typically gauge whether a meal is successful depending on whether or not there are leftovers and if they are “starving” (their words) after school. This one passed the test. We recently purchased our first set of Thermos canisters for the kids so that they can have “hot lunch” at school. They were very excited to be able to have meals that stayed warm by the time they ate them. For lunch #4, I made a Vegan Chili with stewed tomatoes, black beans, red beans, chickpeas, onions, corn, and tomato sauce which I then seasoned with traditional chili seasonings. I also gave a side of bread because I knew the chili was a little spicy and wanted to make sure that they had something to tame the “heat” if needed. I then packed an apple and hummus with bell peppers and cucumbers for the two snacks. 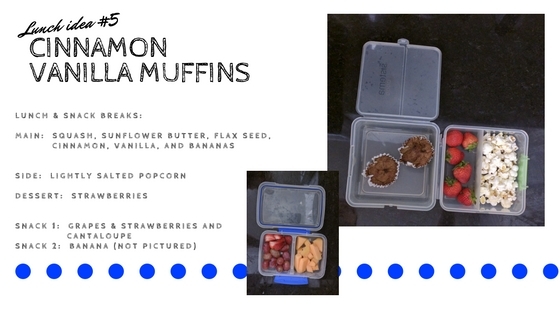 For my fifth lunch I packed two homemade vanilla cinnamon muffins with strawberries and popcorn on the side. I also sent a Sistema container with grapes, strawberries, and cantaloupe for first snack and a banana for second snack. Again, I was a bit worried that this may be too little, but the kids said it filled them up perfectly. I also need to keep in mind when packing lunches that they don’t have a long lunch period, so although it may seem small, when I pack larger lunches they don’t always have the time to eat it all and food ends up coming home or getting spoiled. As a bonus, I also added one image of the lunch I pack for my husband. I pack him a bit more than the kids. 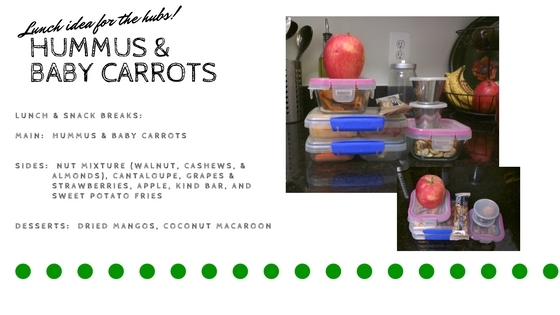 In this day’s lunch I packed hummus and baby carrots, nuts, fruit mix, an apple, a kind bar, sweet potato “fries”, dried mango and a coconut macaroon. I also pack a bottle of water with each lunch and add a bottle of unsweetened tea for my husband. He also has snacks at work he can delve into if he is still hungry. This is just a slice of what we have done so far, but it allows me to share what seems to be working in our home. In addition to the lunches shown, I have also packed beans and rice and gluten free (rice and corn) pasta with marinara sauce, but was in a hurry those mornings and forgot to take pictures. Other ideas that I plan to send in the future include black bean meatballs with marinara, falafel patties with Tzatziki sauce, various soups as we get into the winter and possibly spring rolls and veggie sushi. I love a good challenge and I look at creating these meals as a bit of a game. I try to have fun with it. 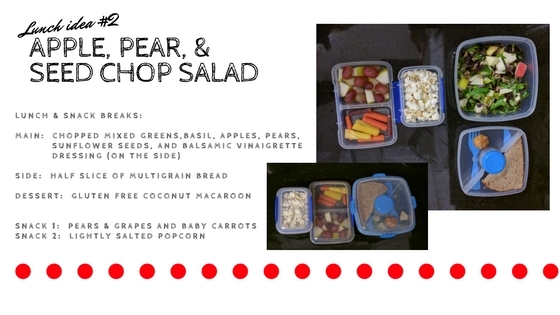 A major key to making these lunches work are having fresh foods in the fridge and doing a little prep work on Sunday. I typically make a big batch of black beans, rice, and chili. That way I have easy go to lunches. I also keep fresh washed apples in the fridge and try to keep bananas stocked as well. I always buy bananas in bulk because I use the browned ripe bananas for lunches and the over ripened ones for baking or smoothies. And I get a fresh batch of greens on Sundays which allows me to make the salads. I try to ask for feedback from the kids too. We’ve had to purchase some new containers to better contain different liquids so that foods do not run into each other after getting feedback that the lunches were “soggy”, “messy”, or just plain “gross”. The kids are not allowed to bring glass containers, so we found and love the various Sistema lunch containers. We also recently bought our first Thermos containers so that we can send hot food! For my husband I use glass Pyrex Snapware. This also allows him to microwave his meals at work without having to change containers.